This extraordinarily original 1925 SV, Model 252A, was built by the the Steam Vehicle Corporation of America (the company that purchased the Stanley's business in 1924). 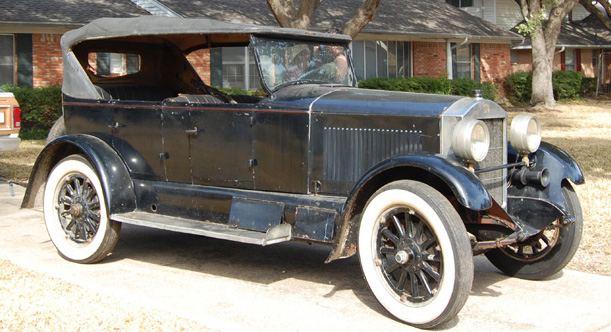 She was purchased in a used car lot in the early 1930s and spent the next six decades in a garage. In the 1990s, the car was sold to Carl Amsley and then to a Virginia collector from whom we acquired the car. Amsley put the nickel plated condenser on the car (we have an original condenser in black that will soon go back onto this car.) Amelsy also installed a hand pump, somewhat crudely, as the car came without one. This is the first steam car that Don, Carolyn, and CJ fired up and ran. See this vehicle under steam. It continues to serve as the main outreach vehicle for the Virtual Steam Car Museum, where it visits classes to talk about the values of history and engineering in today's society. This car is currently for sale. Contact us if you are interested is acquiring this historic vehicle.